Use Cook'n to Organize all your recipes. 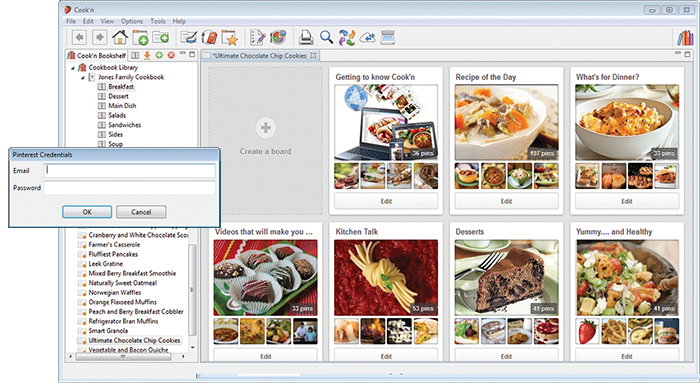 Easily Capture Internet Recipes with Cook'n! 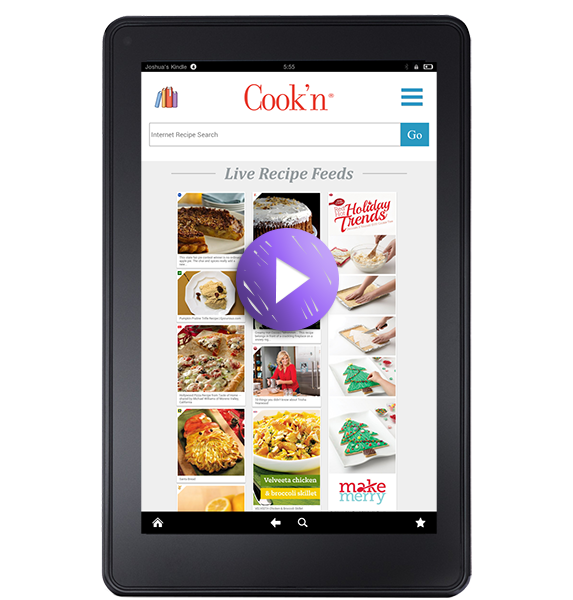 Making custom menus and meal plans is easy with Cook'n recipe app. 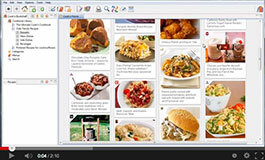 Just drag and drop recipes and food items to plan your menu. You can even embed menus inside other menus. Make a spaghetti meal with french bread, a salad side dish, and beverage and drop that meal plan under the "Dinner" label on Thursday night! It's that simple! 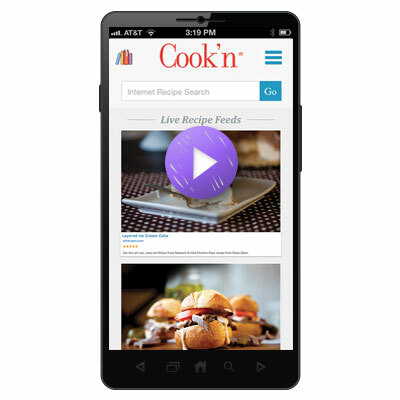 When your menu is all set to go, Cook'n recipe app will make a shopping list with one click! With Cook'n, weekly shopping trips are a piece of cake! And, mealtime is simple because you know just what to make and you know that you have all the ingredients on hand to make dinner. No more last minute scrambles to the store or settling for fast food just because you can't think of anything better for dinner! Cook'n recipe app makes it easy for you to combine your favorite Pinterest recipes with the recipes that you typed, scanned, captured, and imported into Cook'n! Best of all, you have total control of the level of the detail and the period of your menu. 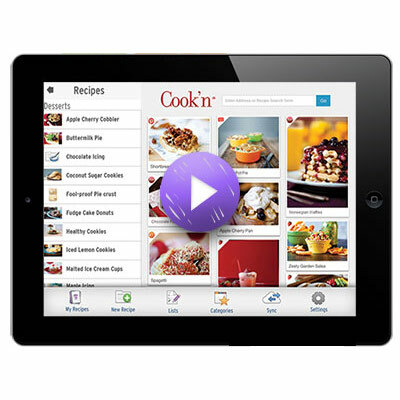 Cook'n recipe app will print your menu plan and all the corresponding recipes as well. That way, you can post it on the fridge and instead of asking "what's for dinner?" the kids and your spouse can help at mealtime! Stop guessing what nutrients are in the foods you are eating. Use Cook'n recipe app to help you stay organized in your dieting! Cook'n recipe app makes it simple to calculate the nutrients your body is receiving. 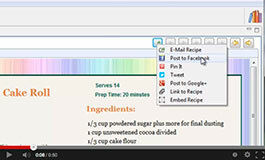 After typing in a recipe or importing one from the internet, simply click a button for the information you need. Save you a ton of time by analyzing nutrition in seconds! You don't have to be a nutritionist to understand how to analyze your recipes -- that's because Cook'n's nutrition facts window looks just like the label on a can. 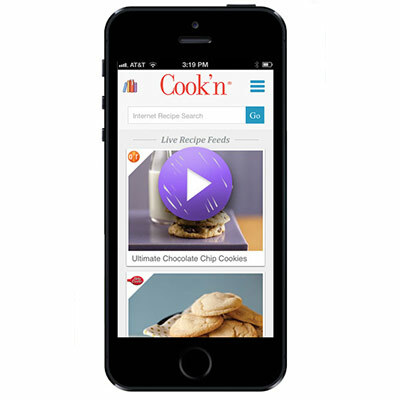 Cook'n recipe app has nutrition facts from the labels of over 10,000 food products. You can even choose between different brands to see what the nutritional effect is. Stop the guesswork among different brands and know which one is most appropriate for your needs. When printing out a recipe or cookbook, Cook'n recipe app gives you the option to include nutritional information right underneath the recipe. Now you can plan menus based on dietary needs and tastes. Prepare healthy, delicious meals for the entire family. Cook'n recipe app also calculates the approximate cost of your shopping list. Cook'n recipe app automatically combines the food on your menus and makes a grocery shopping list. It even converts tablespoons of tomato paste to 8 oz. cans! Cook'n recipe app organizes your shopping list by aisle to save you time at the store. NEW! - Now shopping list integrate with Mygofer.com and the Green PolkaDot Box for easy online grocery shopping. 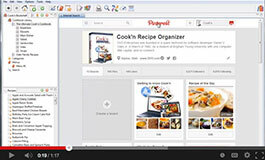 Cook'n Recipe App will Automatically import all of your Pinterest recipes with one click and synchronize the two so any new recipes that you Pin will automatically appear in Cook'n recipe app! It's not magic... but it's pretty close to it! With the new Scan-It feature, it's easy to get all of your printed recipes into Cook'n recipe app without having to type any of them! 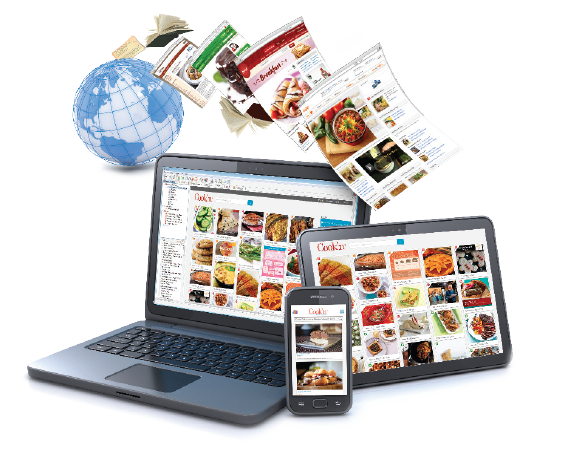 Importing recipes you clipped from magazines and newspapers is easy... just scan them! Or, take a picture with your mobile phone. 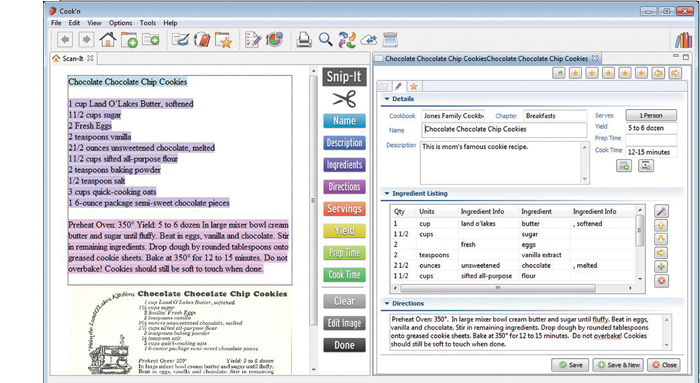 Use the Scan-it feature to translate scanned recipes to text and use the Snip-It tool to copy & paste the text into Cook'n recipe app with just a few clicks! 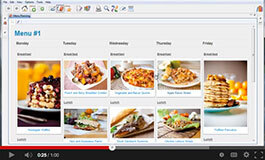 Most of the time, you can capture internet recipes with just one click. 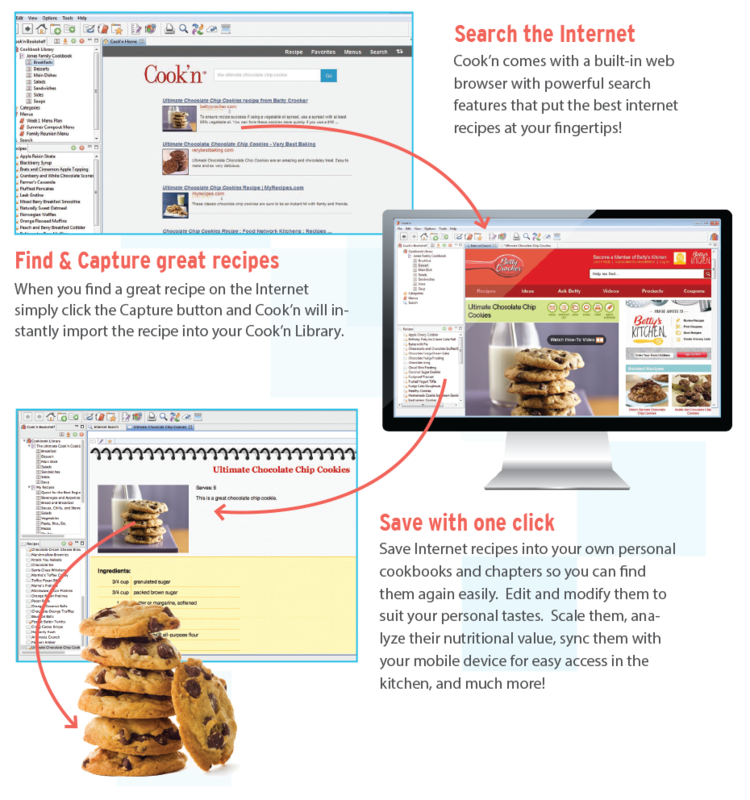 However, this doesn't work with web pages that are not formatted properly (like the recipes posted on many blogs). Enter Cook'n Version 12. 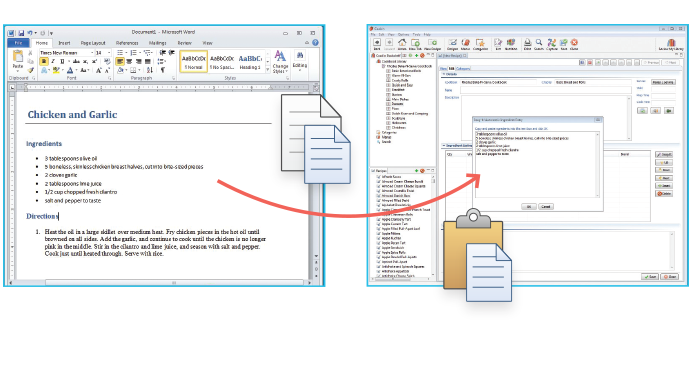 When Cook'n Version 12 detects web pages that are not marked up properly, it will automatically split the screen and display the Snip-It toolbar in the middle. Simply highlight the recipe directions and click the Directions button. Highlight the recipe ingredients and click the Ingredients button. With the new Snip-It Tool capturing recipes from your favorite blogs is a snap! 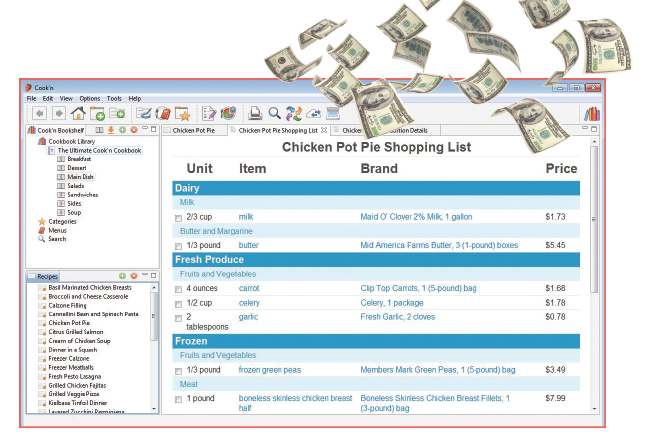 Create menus, meal plans and much more! Let the World's Best Recipes Come to You! Looking for recipe inspiration? Rather than browsing allrecipes.com, foodnetwork.com and other recipe websites, just launch Cook'n! 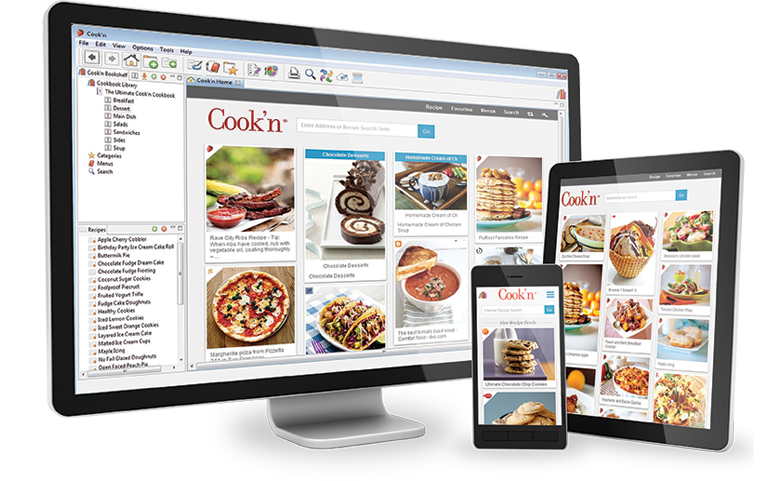 As soon as a new recipe is posted on the web, it will appear in the Cook'n Live Recipe Feed. 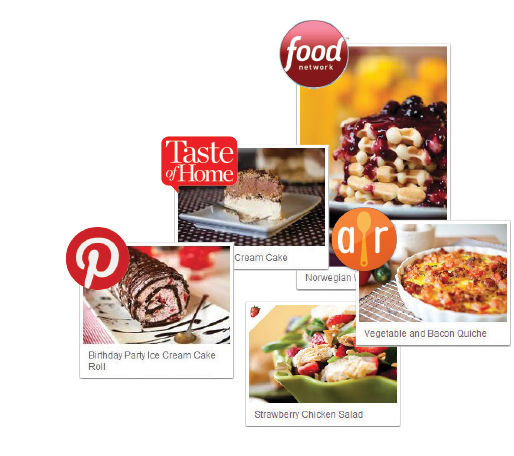 Customize your recipe feed and follow your favorite websites easily. Click the recipe to see more or simply drag & drop it to save it in your personal cookbook. 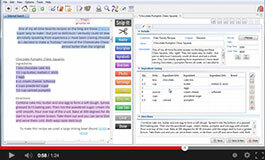 Copy & paste text into the Cook'n Snag-It tool and Cook'n will do the rest. 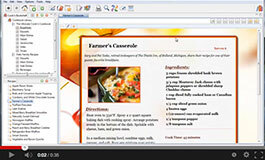 Cook'n Recipe App makes it easy to import recipes from Word, Notepad, and all other text based program. 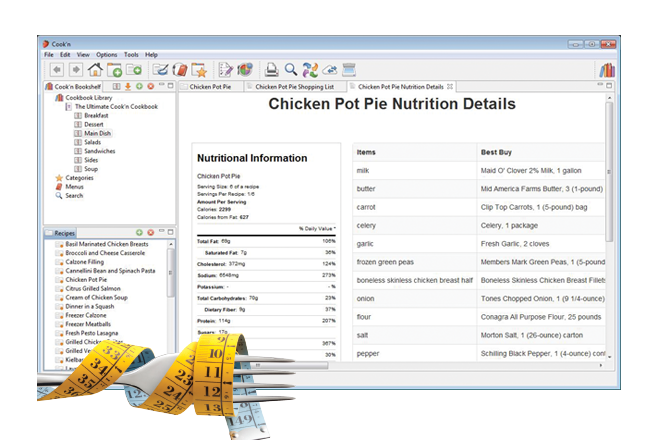 Just copy the text and paste it into Cook'n and the Snag-It tool will parse the text and divide ingredient lines into their component parts automatically! The themes in Cook'n are great! And, they're getting better all the time! 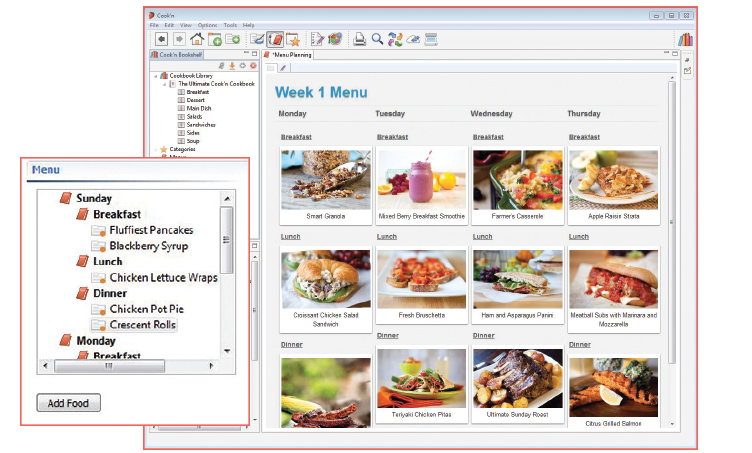 Now, with Cook'n 12, your printed recipes can look just as fantastic as they do on the computer! 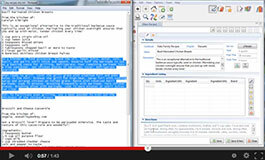 In Cook'n 12, the print preview window is embedded inside Cook'n. 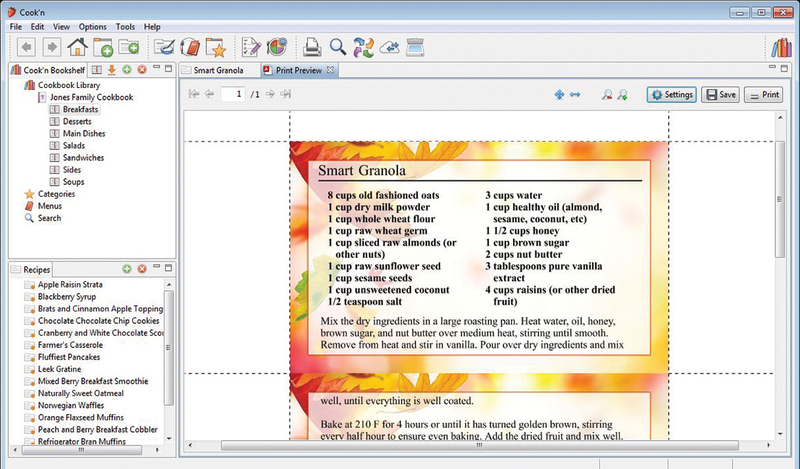 And, the new printing tool is capable of printing themed recipes in all formats (3x5, 4x6, and full page). 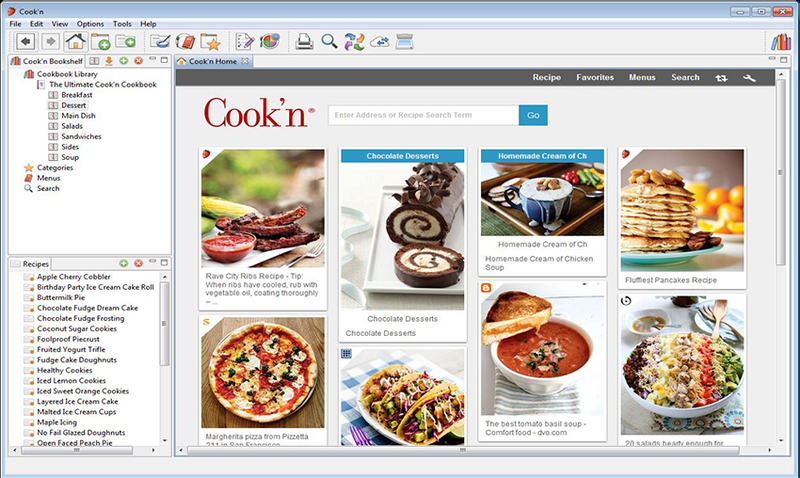 Add pizzazz to your recipes and share them in style with Cook'n 12! Several years back I was looking for a way to consolidate all of my recipe cards, magazine tear outs and post it note scribbles not only for my own personal use but also to leave a legacy for my children and grandchildren of all those family favorites. At that time Cook'N was new on the market and I thought it was a great product that met my needs. Little did I know that these innovative people at DVO would keep their creative juices flowing right into the age of iPhone/Android Apps!! I can now access my recipes on my phone across the country, on my netbook in my kitchen, and everywhere in between. 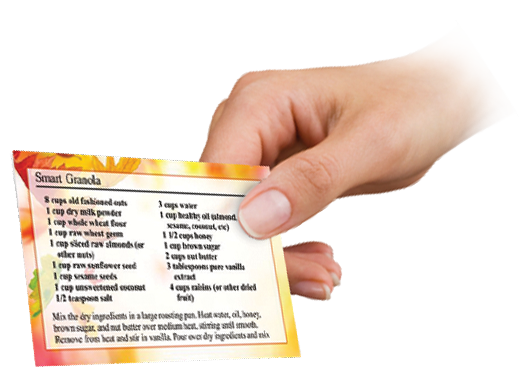 With the newly released Version 12, my days of typing in recipes are over as I am now able to scan in all those cards and tear outs and better yet, access recipes on line and automatically pop them into my Cook'N library! If you are afraid that you are not ready for computerized cookbooks, not to worry, just contact DVO customer service and they will talk you through anything you need to know.Can't say enough about this wonderful product and the customer service that comes with it! I have used this software for years. It as evolved from a decent cookbook software package to a magnificent cookbook package. 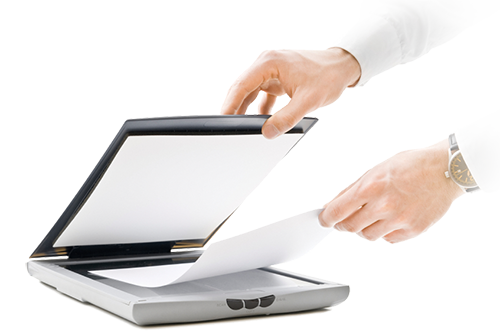 The new printing functions are awesome and the recipe capturing modules have become nearly perfect allowing the user to capture recipes from almost any internet site or any electronic medium. 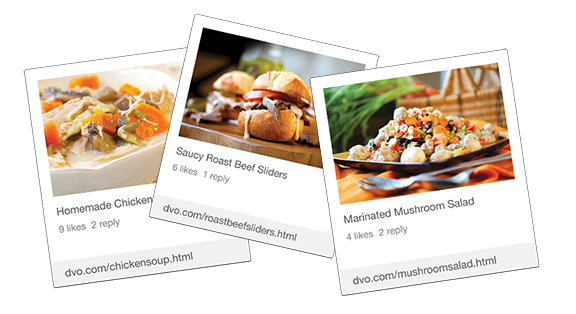 The cloud sharing functions work well allowing you to share your recipe books with anyone you share your account with. 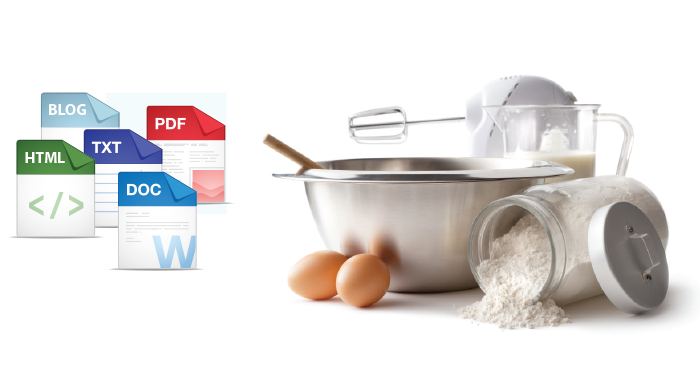 You can truly make a family recipe book by sharing a cloud account with all your family. New recipes and changes show up within minutes of someone changing or adding something. It is truly "The last cookbook you will ever need". I was given the opportunity to try this product, and I will tell you I absolutely love it!!! The tools that are available are wonderful, pinterest capture, snip it from blogs and snag it from word are just some of the wonderful features. I also love that it has a menu planner, grocery list generator and nutritional calculator. Can not recommend this highly enough. It is a product once you try, you will always use.